"...I just can't believe that a Shabbos away from home should be so memorable..."
The quote reads like an excerpt from a camper's postcard home, but is actually part of a note sent to Achiezer's office in response to the writer's stay at Mercy hospital. Following Rabbi Dr. Aaron Glatt's appointment to the position of CAO at Mercy Hospital, more and more members of the frum community have begun to choose Mercy for their medical needs. Determined to provide them with the utmost, Rabbi Dr. Glatt reached out to Achiezer. Thus began a long year of discussion, negotiation, planning, and construction, on what was ultimately to result in Achiezer's recently-inaugurated Mercy Hospital Respite Room and Bais Medrash. 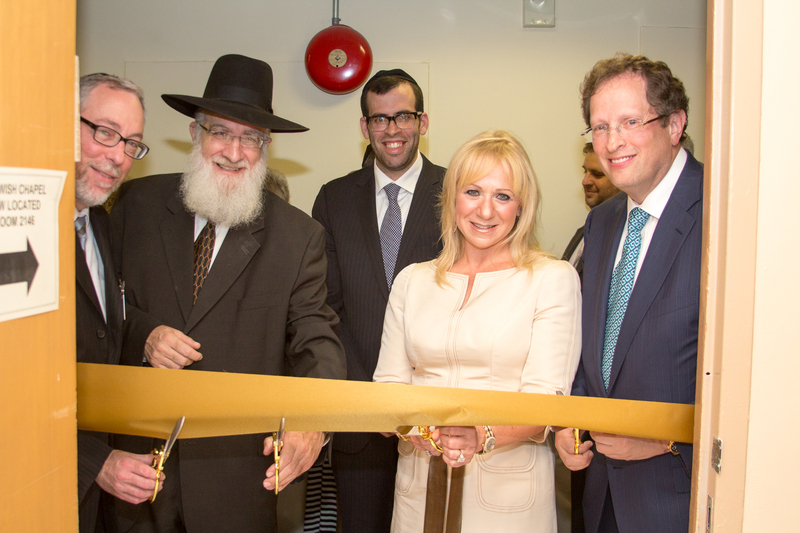 On Thursday June 27th, community leaders including local Rabbonim, coordinators of Chevra Hatzalah, as well as Achiezer staff and board members joined together with the Silber family from Lawrence for the formal Ribbon Cutting Ceremony and dedicaton of the newest addition to Achiezer's respite room program. What exactly is the Achiezer Respite Room at Mercy Hospital? It's an oasis of peace amidst the frenetic pace of life with illness. It's a place where patients and their families relax, unwind, and recoup their strength after harrowing days and nights in the hospital wards. The room is artfully constructed with all of the amenities of home: state-of-the-art meat and dairy kitchen sections; private bathroom; and comfortable sitting area. Careful attention to detail is evident in every corner, from the built-in hot water urn to the customized lighting system that cannot be accidentally shut off on Shabbos. Basic staples fill the cabinets: drinks, snacks, treats, magazines, mouthwashes, (electric) tea lights, and more. Four times a week, volunteers stock the room with fresh food, including fresh bagels, danishes, and wraps. Each Friday, the warmer is filled with hot cholent, kugel, meat, chicken, and soup. Just a few doors away from the respite room, Achiezer's newly-built Mercy Hospital Bais Medrash provides a welcome alternative to the ubiquitous 'multi-faith chapels' commonly found in hospitals. Replete with an ample collection of Siddurim and Sefarim in several languages, the Bais Medrash is made even more remarkable by its location: smack in the middle of a Catholic hospital. The room plays host to a Mincha Minyan on most days, and is always open for Tefillah, Tehillim, and learning. There is no way to adequately describe the relief and appreciation of patients and their families. To finish the missive quoted above: "I just can't believe that a Shabbos away from home should be so memorable to me...every food item you can imagine, including anybody's desire, from hot cholent to icy freeze pops...I can just say, 'Mi k'amcha Yisrael', and thanks for being there for me when in need."